My name is Louise Armstrong and I'm 36, mother to 2 small boys and run my own pet sitting service. I'm the one on the left of the photo, running with Katie. 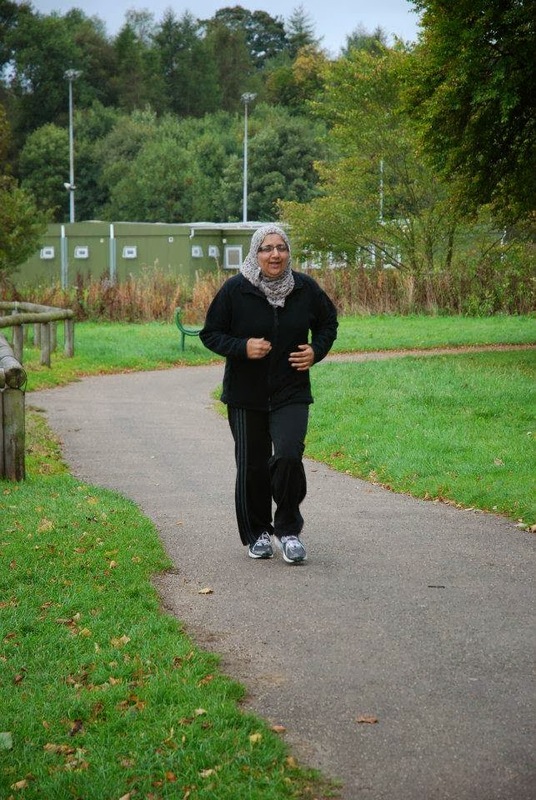 I started running at the end of August 2013 when it was suggested to come along to the 5kGroupRun as it was a way to exercise for free. I had been struggling with my weight and confidence since the birth of my 3 year old and finally realised I had to do something. I didn't start at the beginning so my first session was 90 seconds of running, I almost cried at how hard it was. Over the weeks I had good runs and bad runs. I cried. I felt ill. I laughed. I loved. I cried some more. I have so far lost nearly 4 stone in weight and I have found the confidence to make improvements to my personal life. I completed my first 5km run in October and cried. I have struggled to push myself further but finally managed 7km at Christmas and then 9km on 28th December. My life has changed for the better in so many ways. I have made some wonderful friends who got me through the bad runs and celebrated my achievements with me. Next stop is to do a 10k run and try improve my speed so I'm not always last to finish. This group is awesome, amazing, life changing and inspiring. If I can do it.....ANYBODY can!! My name is Rick Wilson, I'm 46 (feel 16! ), live in Blackburn and work at Lancashire Trading Standards Service in the Alcohol and Tobacco Team. 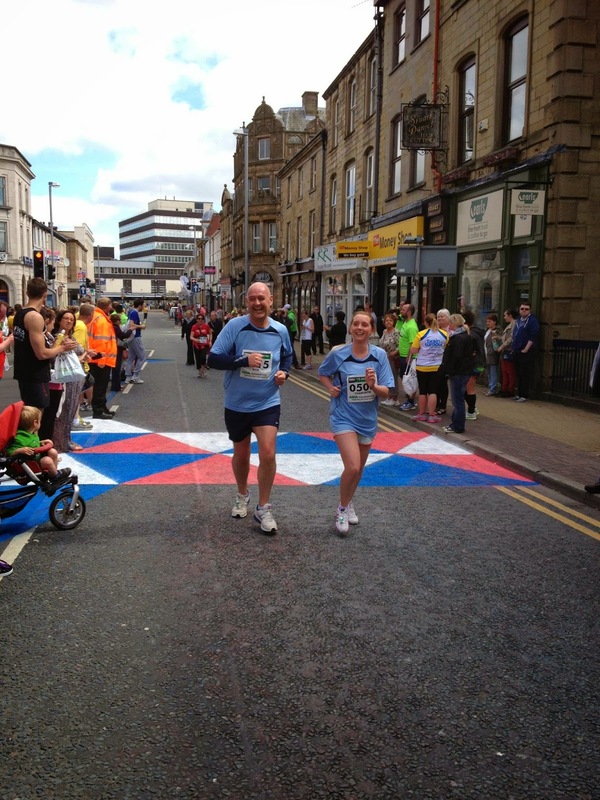 That's me coming towards the finishing line at the 2013 Pennine 10K. Until April 6th 2013 I think the furthest I had ever ran was to the shop and back, and that was about 20 years ago! So, what happened on April 6th to change that? Simple, I signed up to do a charity 10km race on the spur of the moment with a group of people I work with ...crazy! To make matters worse, remember I had only previously ran as far as the corner shop over 20 years ago, I didn't participate in any activity at all - I had never been fit in my life!! To further complicate things, on April 6th 2013, I weighed in at 19st 4lb and was smoking too! 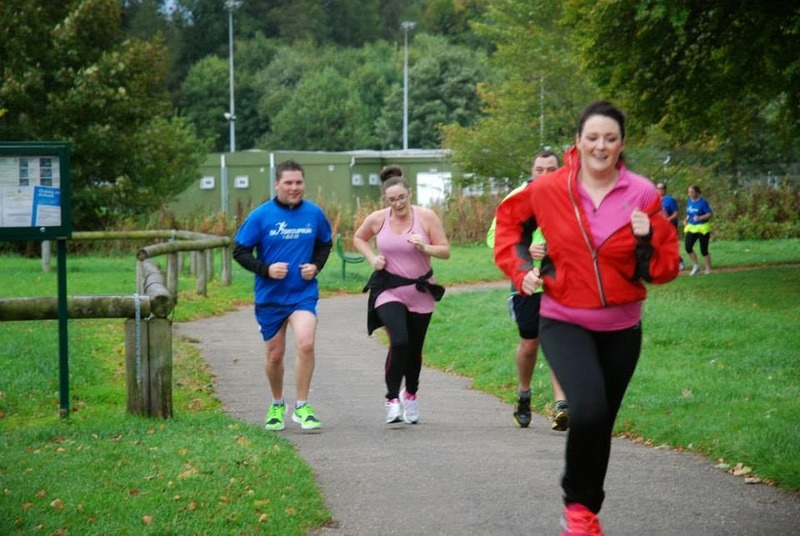 However, I had made a commitment and stumbled across the NHS Couch to 5k training programme. I decided to give it a go. Now, as a bit of a geek, I did my usual and spent hours researching the plan on the internet. My conclusion was that as long as you trusted the plan, and committed to the training, you would achieve your goal. I decided to give myself a better chance by stopping smoking. No patches or e-cigarettes, just stopped and concentrated on the training. When I started the plan I honestly didn't see how I could ever run 1km, never mind 5km which the plan covered - and don't forget, the race I had signed up for was a 10km distance! However, I trusted the plan, my goal was to simply successfully complete each individual run and I didn't look any further ahead than that. I remember the first big step up half way through the plan was from an 8 minute interval run to a 20 minute run without stopping and I was terrified!! I put all my trust in the plan and you know what, I did the 20 minute run and although it wasn't easy the sense of achievement was amazing ...possibly early signs of that 'runners high'. On Sunday 2nd June, 8 weeks after I started training from scratch I successfully completed the Pennine 10K and was two and a half stones lighter. My own success gave me the motivation to help more people to complete the plan by starting this group. I have quite a few 10k races and a half marathon booked in during 2014. Hi my name is Les Moulsdale, I'm 50 years old next May and I own Olympic Caravan Services - servicing and repairing touring caravans in Lancashire and the North West . I have known Rick Wilson for a long time as we both own Newfoundland dogs and old caravans and have spent many a night around a camp fire in a muddy field sharing a bottle of malt with other friends. 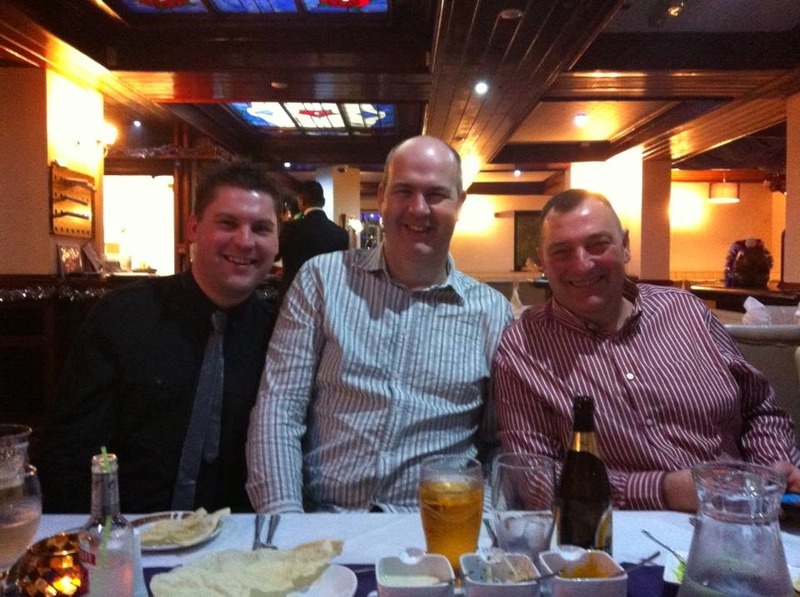 That's me on the right at the 5kGroupRun Christmas meal. Last spring Rick surprised us and said he was stopping drinking and smoking and wanted to diet and start running. As the weeks went by I watched Rick become slimmer and and then watched his first few short runs around our camp site in Wales but I had no intention of joining him, although he did ask a few times if I wanted to. I had left the fire service in March 2012 after 25 years and over the last 15 years had just kept myself at a fitness level that was just about good enough to pass my three year fitness tests. When I left I didn't do anything until last August so it was no surprise that I was was very over weight and had a few health problems. As a child I had asthma and this had come back big time, also my blood pressure was high, I had borderline diabetes and for the last five years I had been having joint pain in my knees and ankles that would flare up for days on end and would make everyday life miserable . At the start of August last year the weather was hot and I was working under a caravan - it was then I realised that I had to do something about my weight and health. 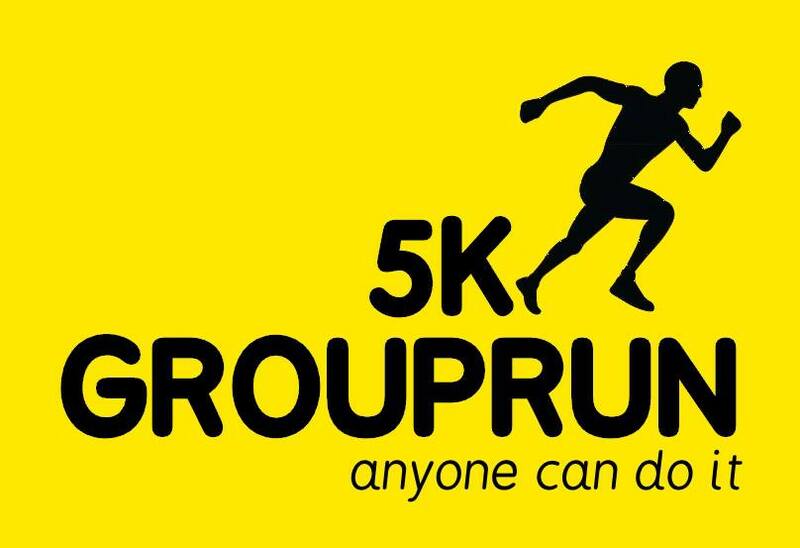 I had seen Rick posting on Facebook about a new group he was starting called 5kGroupRun and my wife Jude said we should go along and try it . Well the night it all started we headed over to Blackburn from Chorley. I still wasn't sure if this was for me so I said I'm only coming to watch but I hadn't seen Rick for a few months and was blown away by how well and slim he looked. Anyway, with his encouragement and the other guys that were there I said OK, I'll give it a go. I managed to complete the 5km run in 5 weeks but I had still only lost a pound in weight and I wasn't finding running easy. In my mind I had done the 5km so it was time to give up as I had started running to lose weight and that wasn't happening, even though I had been careful and wasn't eating anything bad, just low fat food. Anyway I sorted out my diet and started to eat only clean and fresh food and nothing processed.I made sure my body was getting 100% nutrition it needed and soon noticed a difference. The weight was coming off and I had lots more energy so back I went to Witton Park and my running just got better and better . I'm now nearly five stone lighter than when I started and I run nearly every other day. I've set a goal of three half marathons in 2014 and besides helping out with the group I run on my own and have built my distance up to just short of 19km. My plan is to keep increasing the distance as the weeks go by . I now know that joining the group in August was the best thing I've ever done and will always have a dept of gratitude to pay back to Jude for getting me there and Rick and his other helpers and all the other fantastic people that started with me who have encouraged each other to reach their goals. ...if I can run anyone can! Hi, my name's Marianne - I'm 43 years old and live in Blackburn though I'm from Dundee and still have my accent despite living in Lancashire for 22 years! I'm married with a 12 year old daughter, work more than full time in the local NHS in contract management and am kept busy between work, keeping house and ferrying our daughter around! 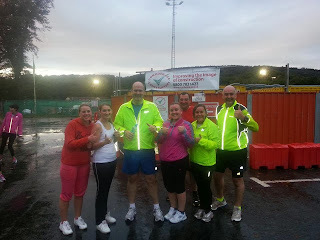 I'm second from the right on the photo, straight after I ran 5km for the first time on 14th September 2013. Nearly 2 years ago I decided I needed to do something about my health and weight, being on the wrong side of 40 (though I keep saying age is only a number!) and over 3 stone overweight, I joined a local weight loss group and lost over 2 stone in just under a year. Life then got very busy with major re-organisation at work etc and I found I had no time for myself. 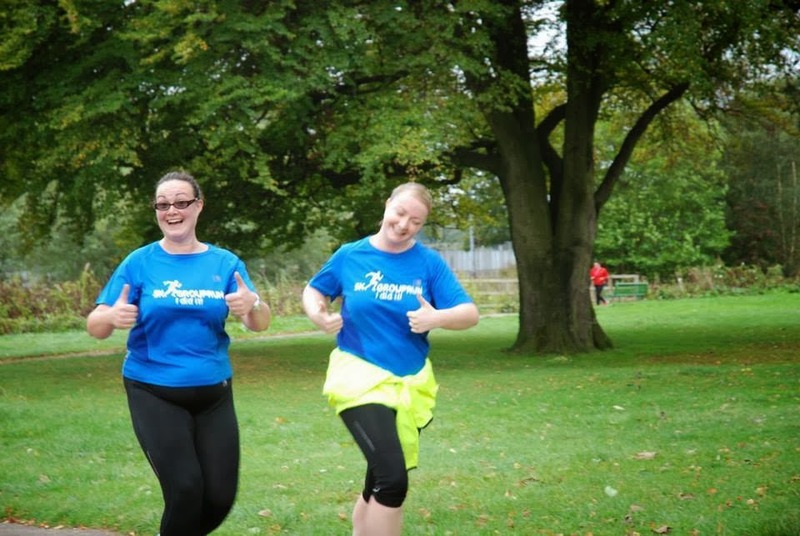 Fast forward to August last year and saw a post on a friend's Facebook about the 5k run group and I went along on the Saturday morning of week 2 and haven't looked back since! Rick has been a fantastic leader and mentor to us all as well as the support from all the group members - we've gone from being a group of strangers to being good friends and social buddies in a few months. I certainly couldn't have got this far without everyone's encouragement and we all keep each other going. I completed my first 5k in week 5 (I think) and have since run 5ks usually twice or three times a week, ran the Grouprun in Townley Park in Burnley with all the group in October, ran 5k from South to North pier at Blackpool during the illuminations, did the Santa dash down Blackpool prom in December and I've completed my first 10k in Feb 2014. Next on the list after the 10k - a half marathon (Cardiff 2014) then I might get the marathon ticked off my bucket list at some point sooner rather than later! If I can get this far, anyone can. Happy running folks! Hi I'm Stacey (2nd from the left pictured straight after my first ever 5km run), aged 29 and like most I have not done any exercise since I was a teenager. I have two children and my weight hasn't been the same since. My problem is motivation, finding time to exercise and having confidence to go out and join somewhere. I really wanted to improve my health (even though I'm not overweight I was nowhere near healthy) although I still wanted to shed a few pounds to help look my best for my wedding. I was really nervous about coming down to Witton Park for the first time but I didn't need to worry. I don't think I have ever met a nicer group of people who really motivate and look out for each other. 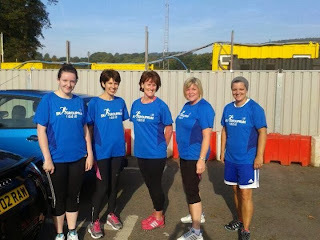 This group has been a great confidence booster and because I have followed the couch to 5k plan, and done it in a healthy way I have lost 9 pounds so far and managed to keep it off, even over Christmas. All it takes is a little bit of dedication and as Rick says believe in the plan! Hi, I'm Heidi Brown, I'm 44 years old and I work for Integrated Dental Holdings as a multi site manager. I'm the one on the left in the pink vest. I came across the group by chance on Facebook last September. It was a spur of the moment decision to attend. I hadn't done any serious exercise in years and had gained 3 stones due to giving up smoking and my Inactive lifestyle. My confidence was low. On the first session I arrived on the car park to see the group stood around talking all wearing running gear, looking like 'real' runners and I instantly wanted to turn around and leave. I felt foolish. I couldn't do this. It was too late they had seen me. I had to stay. My friend Kirsty, arrived and to be fair in her glittery t shirt and clutching a bottle of sparkling water she was as ill prepared as me. I didn't realise at the time I was having a life changing moment. We were instantly made welcome by the whole group, most had already completed the 5k but they took turns in running with Kirsty and me and encouraging us through the plan. Ashley, Justin and Rick were amazing it was like having personal trainers. We started at week 5 which was tough but with the groups belief in us we completed the plan in 4 weeks. It wasn't pretty but I ran every step of that 5k. I could have burst with pride. This was me. I never thought I could do it. As I turned the corner to the final section every member of the group cheered and clapped me on. A bunch of totally inspirational people who helped me change my life. I feel healthier, happier and my confidence is returning. I'm now 2 stone lighter, I regularly run 5k, I ran my first 10k race in Feb 2014 and I have entered the 2014 Cardiff half marathon. I actually love running. I never thought I'd say that. I have also made some amazing friends. The part I love most about the group is we are in it together. If you have a bad run (which happens) everyone has a bad run because nobody will ever leave you to run alone. I'm very proud to be part of this group. The best advice I can give you is to believe in yourself. You can do this. My name is Sakera Sheth, I am 21 yrs old...ok maybe not, but that's how I feel after all this running!!! I work for BwD Childrens Services and I am married with four beautiful children. Like many others I work full time and had no time for the gym or any other exercise in my life until, in Sept 2013, I came across the 5kGroupRun on a friends Facebook page and thought I had no more excuses left not to get fit. The session times worked for me and as it was 3 times a week it meant it was regular. I frog marched (literally!) a mate along with me (well I wasn't gonna be in agony on my own was I? ....I needed to share my aches and pains!!) and 4 weeks later I completed my 5km run and what an achievement it was! I was well proud of myself! I feel fitter, healthier and have made a whole new bunch of friends who are now my second family. They are always there every step of the way, through the good, and the not so good, days - cheering me on and encouraging and motivating me each week! My second family is FAB and each one of them is special and unique. You too are now part of this family and you will find that they will all be there for you as you start your special journey. I have now completed two 10km races and I loved them! Hi, I`m Justin I’m 37 years old, live in Clitheroe and work for Lancashire Constabulary. I'm the one in the blue supporting some of the fab GroupRunners. 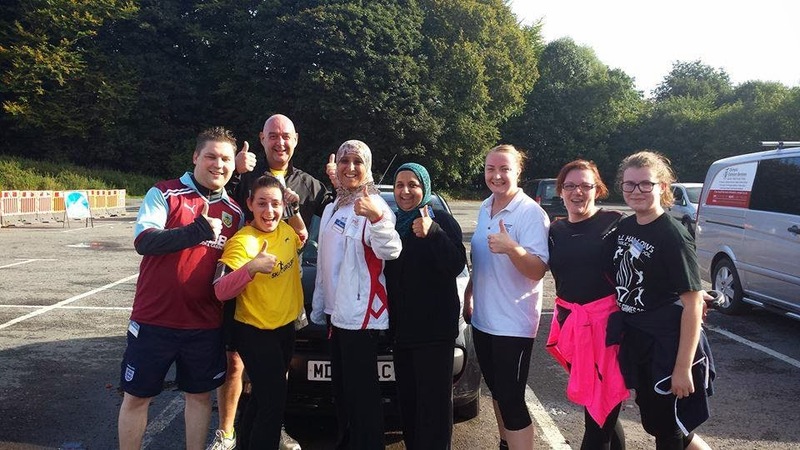 Before joining this group I hadn’t `run` since school, I wasn't doing any exercise, I was approaching 16 stone and feeling very unfit. I also struggled to keep up with colleagues at work when we had to run after people and my idea of a 3 course meal was a kebab, chips and a can of pop when we had a break at work! 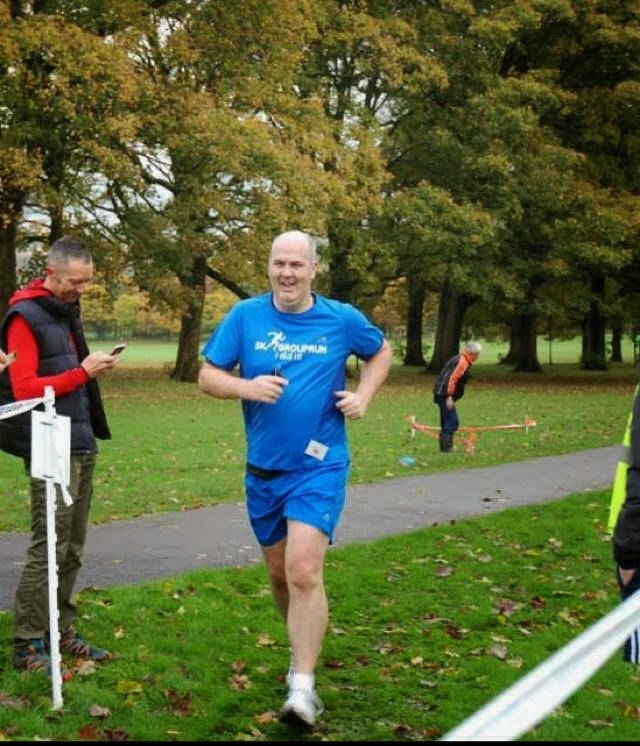 Last summer all this changed when I had a conversation with my good friend Rick Wilson who `encouraged` me to take part in a new group he was setting up called 5kGroupRun which would follow a plan he had already done and enable me to run 5km at the end of it. I said he was dreaming about me but humoured him and went to Witton Park in Blackburn one warm summers evening in August 2013. I was amazed by the amount of people that were there but was comforted by the fact that everyone I talked to seemed to be in the same boat as me. At this point something amazing happened .....I found myself liking running……..A LOT….! I ran with the group and when I couldn’t make the sessions due to work I ran on my own, religiously sticking to the plan. After only 4 weeks or so Rick suggested I try for the 5km as I was doing so well ( I told him he was out of his mind!!!) but he was supportive (and persuasive!!) and I trusted him when he said I could do it. On the day of my big run I arrived 30 minutes early as I was so nervous. I have always doubted myself, I genuinely didn’t want to fail and let Rick down, but I set off with OJ (one of the volunteer helpers) and 35 minutes later I arrived back in the car park to find the rest of the group waiting with hugs and cheers, I suddenly thought this was a very big deal! At that moment I made a promise to myself I would keep going , and repay the help and support the group had given to me and help and inspire the others to all achieve their goals…..these people I now consider my really good friends. The day of the end of the plan came (the Burnley Parkrun) and although most had already achieved the distance this was a massive event for everyone. We all had a personal story that day but safe to say there was a lot of hugs, cheers support and tears (happy ones). 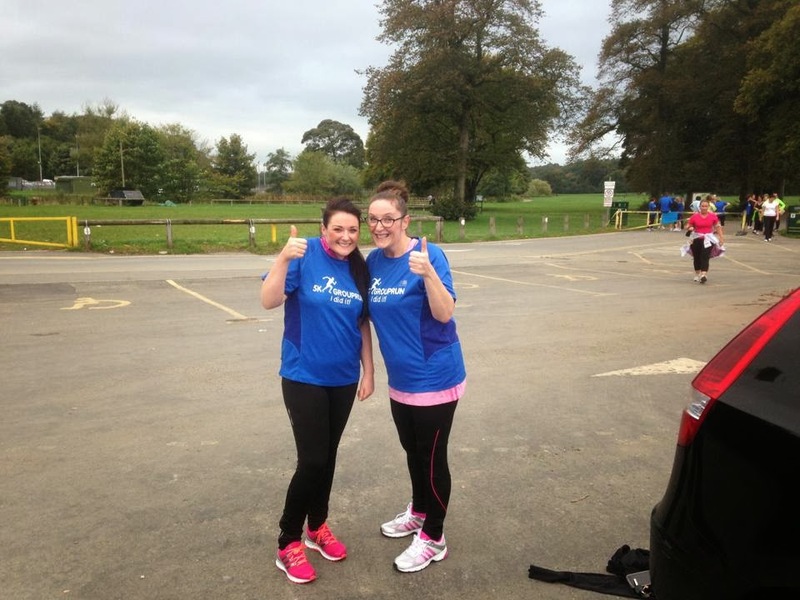 2) to help and support the next group of runners through the 5kGroupRun program………really anyone can do it! Hello... I am Kirsty Barnes and I am 26 and I work as part of the management team for Integrated Dental Holdings. I'm the one on the left with my friend Heidi. I've always been a self confessed couch potato, even through school I was only good at sports which consisted of me having to do as little as possible. I just came to the conclusion that I wasn't athletic like my friends and to be honest, I was OK with that. I felt that you either 'had it' or you didn't... and I didn't! Over the years, my weight fluctuated constantly. I would lose weight and then within weeks I would give up and pile more back on. It really was a vicious and extremely unhealthy cycle. But this didn't motivate me to get off my bum and do something about it. I just gathered that this was me and I couldn't change it... how wrong I was! 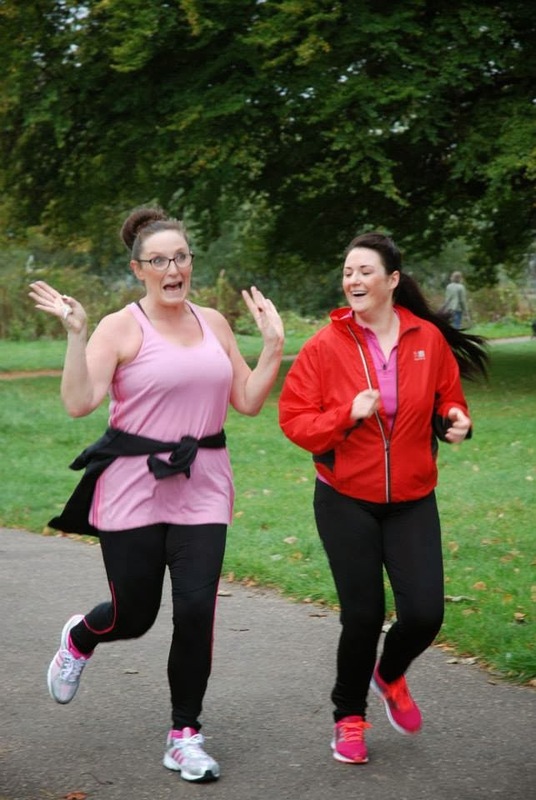 THAT... was 6 months ago and in that time I've lost 2 stones and 3lbs to date... but the proudest moment of my ' healthy' journey was joining the amazing 5kGroupRun. Heidi text me about it on a Friday night, it was on a whim and I was unsure but I decided to go along with her and give it a go. The best thing I ever did... and I mean that! We arrived and it was so daunting... I was totally unprepared in my leggings and 'chic' t-shirt and my bottle of sparkling water (you can tell I'd NEVER ran before) but Ash and Rick were amazing... and as we had joined the group late we ran for a full 5 minutes which I didn't think was possible. I was so impressed and instantly got the bug. Proud wasn't the word when we successfully completed the plan on the 19th of October 2013 only 4 weeks after starting it! It was hard, there was tears but I'd done it and have never looked back. I'm Tracy and work for Blackburn with Darwen Borough Council as a Geographical Team Leader within the Children Centres. That's me 2nd from the right. Like many people I work full time, have a very busy life, running a house, driving mum's taxi etc. I decided I wanted 'me time' and wanted a new challenge. I was bored of the gym which I had joined many times over the years but never enjoyed them. I came across the group on a friends Facebook page, sent her a text about it and went along, nervously, to the Saturday morning session on week 3. I loved running at school and thought I would love it again. I DO!!! This group has supported me so much to achieve what I have ....they are so kind, caring, funny, barmy! They are so encouraging and make you believe you will succeed. If I had tried to run on my own I would not have achieved what I have ...I would have given up and gone back to being a couch potato! On week 7 of the plan i did the 5km, then built up to my personal best distance of 9.1km on 28th December 2013. My aim is to reach 10km, then improve on time not distance. Hi, I'm Ashley Weir, I'm 44 years young! My supportive wife is Joanne and we have two girls, Samantha (also a 5kGroupRunner) 14 and Rebecca 10. We live in Bamber Bridge and I work at Lancashire County Council in the Environment Directorate's Bus and Supported Transport Team. It had been many years since I undertook any serious exercise, in truth nothing really since I was a young man! I was probably significantly overweight and knew I needed to do something to improve my overall health and fitness. I used to enjoy running as a teenager and almost 30 years later didn't have the confidence of taking it up again by myself! I didn't know where to start and whether I could actually do it in any case. I had visited a gym but it just didn't seem right for me, I needed something different. Then I came across a shared post about the 5k Group Run plan by my inspirational friend, and our Leader, Rick Wilson! I really thought 'this is it', this was just what I had been looking for to motivate me to achieve some goals and more importantly become fitter and lose some pounds! This was the beginning of August 2013 and I apprehensively joined a group of unknown people on the first Saturday morning. There is no denying it was tough at the beginning but I trusted the plan. I downloaded the app and podcasts to help me when on my own for those odd times I couldn't make the sessions. I achieved my first 5k on 18 September 2013 and couldn't be more proud! After that I helped support those remaining group members to reach their goal! As a group we entered Burnley's 5k Parkrun where many of us ran PBs! It was really awe inspiring for everyone! Regularly now I am running at least 5k three times a week, and in all weathers! Since then I have lost around a stone in weight and feel the fittest I have been in over 20 years! I have improved my times and now looked at extending the distances! Jumping from 5k, 6k, 7k to almost 9k in between Christmas and New Year. It took over an hour and I would have never even imagined 6 months ago I could have run for this length of time. Since last August there have been many good runs, as well as a few bad ones (which is normal) but one thing I have done is lean on many of the group at one time or another and feel extremely grateful for the support all of them have given me. These inspirational people I now regard as great friends and like to think for life! This plan definitely works and all new runners are welcome. As a member of the volunteer group we will endeavour to support everyone in reaching their goals!